Native American Art Pueblo Pottery and Native Art! Over 1000 pieces online! King Galleries Native American Art Pueblo Pottery and Pueblo art focuses on the amazing pottery of the pueblos located along the Rio Grande River, Hopi and various other tribal affiliations across the United States. The pottery originated with a utilitarian function but has evolved as a fine art form over the years. By the early 1900’s it was entering its “folk art” stage while by the 1990’s it was being considered “fine art”. The foundation for each piece of pottery is the native clay. The clay is locally sourced from near each pueblo or Hopi village. The clay holds both a spiritual and cultural connection and reflects the story of the people over the centuries. Today, the pottery continues to evolve as the potters combine their own artistic initiative with a focus on their own culture. Each piece is hand coiled, not wheel thrown. The surfaces are carved, etched or painted. The shine on each piece comes from being stone polished or burnished. No glazes are used. It is a time consuming process yet that is the beauty of the historic connection within each piece of art. 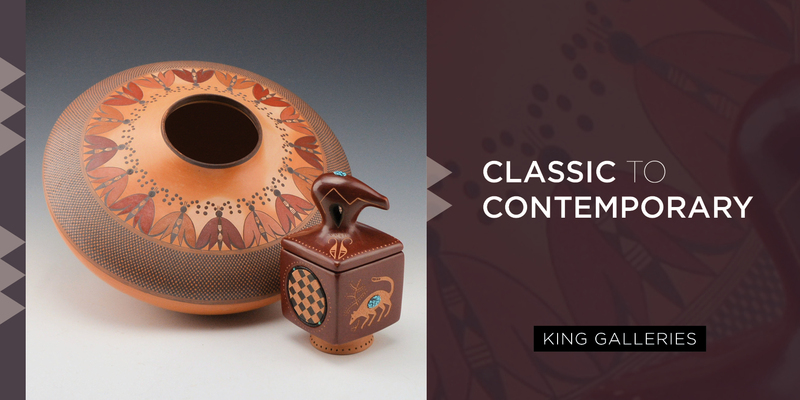 For over 20 years King Galleries Pueblo Pottery has worked with and represented the very best of contemporary pueblo potters. We also focus on important singed historic pottery from the 1920’s onward. Owner, Charles King has written numerous articles and books on Margaret Tafoya, Tony Da and Virgil Ortiz. He has given lectures nationwide on the creative innovation of contemporary and historic pueblo pottery. Please visit his profile page under the heading ‘about’, to read more about Charles. Check out our ‘events’ page to see what is upcoming at the gallery. Each day we have new additions added online, so please check back often! Enjoy our pottery at King Galleries!